Home » Leftism » Anti fun brigade » Stop press!! Jeremy Sear proves that he has no sense of humour! Stop press!! Jeremy Sear proves that he has no sense of humour! I’m sure that Jezza would not denounce Tina Fey for her parody of Sarah Palin and like may conservatives I appreciated that as well, so I’m going to go out on a limb here and suggest that the reason that Jezza is so upset by Derek Sapphire is that he exposes an rather unwelcome truth about lefties, and that is the fact that they have no ability to laugh at themselves or those of their own political persuasion. More importantly I am sure that the authors of the “cut and paste” section of the Oz are not as naive or humourless as our Mr Sear is in his piece or his cohort of drearily serious commentators at Pure Playschool are insisting in the comment thread. Further I want to add that despite the crap form the totally humourless Sear this blog is more than happy to make all kinds of opinion welcome even those from a consumer of Decaf Soy Lattes and we accept at face value the claims made by Derek in the post I link to above. By Iain Hall in Anti fun brigade, Blogging, Comedy, Humour, internet, Leftism, Media Matters, Multiculturalism, Political Correctness, Popular Culture, wankers, WTF??? ERR??? on January 17, 2011 .
worse still if you knew in your heart of hearts that they never will be voted into power and that most of the people are eternally grateful for that fact. Is there a secular patron saint for lost causes? My wording was a bit askew, I meant to say, like you, that they never have, and never will. I wonder also about how the delightful Derek Sapphire feels about being unmasked? In all honesty Iain, Derek is not funny. Good satire takes more than just insisting day is night or white is black, which is about the equivalent of Derek’s, sorry, Matty’s brand of humour. Where Jeremy gets it wrong though, is that he seems to think he is the only person to realise that Derek is a send up (of sorts). That’s what happens when you think you’re better than everyone else, you lose perspective. GD, Derek hasn’t been unmasked. 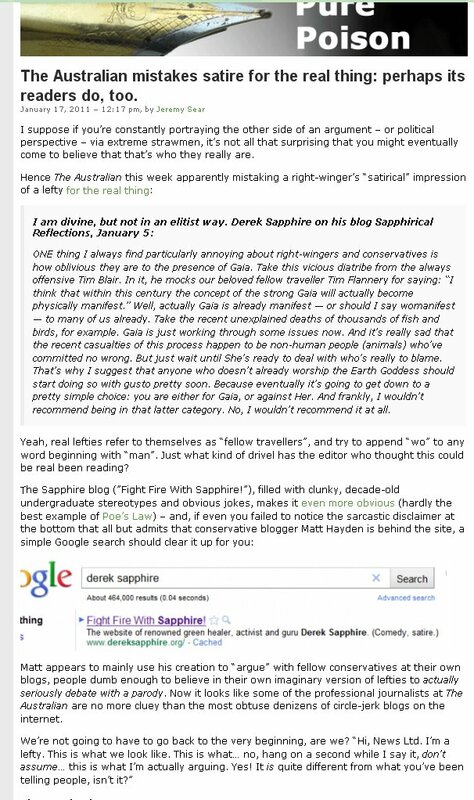 He has never hidden the fact he is Matt Hayden and it’s right there at the foot of his blog with a disclaimer of sorts (in the negative of course) and a link to his real persona. Don’t tell me you were actually convinced that Derek was a real lefty! Oh yes, I believed it hook, line and sinker, because Luzu told me on this blog. I’m easily led, it must be the right wing thing. I also remember a few other commenters asking the same question. But yes I agree, whatever he is, he isn’t funny. Ah yes, Luzu definitely thought he was for real. Unfortunately, I think he’s almost too real. I wonder sometimes who’s the parody, Derek or Jezza? If I recall correcly, Jeremy didn’t find PJ O’Rouke very funny at all either. The only reason I could see is because the guy holds views different to Jeremy and pokes fun at his beliefs. 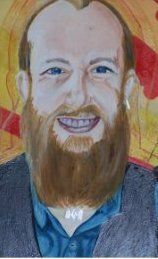 Iain, I’m just wondering how you got Van Gogh to paint your portrait? I was asking about a Secular saint actually. Maybe we should start a campaign to beatify Jezza? So I suggest the secular forces must be rallied to demand Saint Jezza of Ringwood be raised to the pantheon of secular leftist Saints as the patron of lost causes! What can I say? This rumour that I am not real is deeply distressing to me – even more so considering it came from a fellow traveller I used to hold in quite high esteem. The fact that you lot seem to have fallen for this “satire” smear is disappointing too (though not surprising). It’s even a little hurtful. Even though you are mostly backward reactionaries, I have become somewhat fond of you during the course of my recent campaign of attitudinal reconstruction through comments. Well, if you want to believe the scuttlebutt, that’s fine. I have addressed these falsehoods at length on my blog if you wish to learn the truth. I’m glad you’re fond of us, we’re fond of you too; like a exotic creature kept in a cage. Almost a pet, but not quite so friendly, as you don’t seem to like anything we say, but then neither does Jezza. btw I hope you don’t feel sympathy for the looters in Qld like he does. I can almost forgive your recent aberrations about Sharia or communism, but feeling sympathy for the looters would be beyond the pale. We we’d probably have to euthanise you. “This rumour that I am not real is deeply distressing to me – even more so considering it came from a fellow traveller I used to hold in quite high esteem. You held him in “high regard”? Serves you right then. Don’t you think his ego has been lifted enough to viatification already ? Thank you Iain for posting the link. You know what’s really distressing is that I tried to clear this confusion up by leaving some similar comments on blogs written by fellow travellers. But they wouldn’t publish them! And these were blogs I’d often participated in before. So clearly they have taken Jeremy Sear’s vile claims as fact and decided I don’t really exist. It’s one thing to be shunned by your enemies – but by your allies? Even though I loathe and detest you and your vile commenters, I have to say that I feel like you’re the only blogosphere friends I have at the moment. I am a sad to say that far to many leftys can talk the talk when it comes to inclusiveness and accepting the diversity of the internet but sadly not too many actually walk the walk and accept the fact that there are individuals like your own good self who should be welcomed rather than spurned. Jeremy Sear is just a sad venal little man who is just too sanctimonious for his own good if you ask me. Iain, it’s not often that we agree. In fact, up to now it’s been more like never. (You are my sworn enemy, after all.) But I’d have to concur completely with that comment – particularly the last part. Derek, I am not a vile commenter, nor is Ray, although I can’t speak for the others. Although where your ilk are concerned, a bit of vile, or bile is probably warranted. Nice to see you back, anyhow. Oh no! Saying you’d have to euthanase me isn’t vile at all! Regarding the bile: If you feel bile rising, then that’s obviously to do with some inner emotional imbalance on your part. That’s nothing to do with me, I’m afraid. You’d be blaming the victim if you said it was. And I know I shouldn’t say this because you don’t really deserve it. But thanks for the welcome. It is nice to have a hobby. And if I can convince even one of you to become a little more green and progressive, I will have done something good for the planet and society as well. Damn! I thought we’d already done that! Iain, will you take care of this, he’s still scurrying around here like he owns the place! Bought your ticket for Saudi Arabia yet? Why live here in this hellhole of capitalism, when you can live free and unencumbered in a Sharia state? Perhaps you could take the rest of your Darlinghurst sycophants with you, just to give them a wake-up call. No Bo (Derek) its to do with the booze. I will drink to that Bo. Derek is my favourite lefty. May I suggest that you make an application to the Supreme Court declaring that you are in fact a real person? You could also apply for an injunction restraining Hayden from hacking into your site and making your life a misery. And restrain Jeremy from asserting that you are a fake or parody. And maybe sue for defamation too.